Back-To-School Target Cartwheel App Promotions & $100 Target GC Giveaway! I participated in a Blog Blast on behalf of Influence Central for Johnson & Johnson and Target. I received a promotional item to thank me for my participation. I’d like to think that most of us have an obsession with Target, I like to call it my happy place. At least twice a week, I’m wandering up and down the aisles, imagining how a new rug and pillows would look in my living room, picking through the food aisles thinking about how hungry I am and even taking a visit down their fitness section and leaving with a kettlebell in my cart. Let me mention that none of this was on my list. This past week I’ve made more visits to Target, gotta love back-to-school season, and have found so many great savings. Cutting coupons and the Target Cartwheel app have been my saving grace! All in one place, my savings, promotions and discounts have all been at my fingertips. If you aren’t using the Target Cartwheel app, it should be downloaded now. It’s great because you can easily search, browse or scan items to find offers and you can save on your Target purchase by simply scanning your barcode at the checkout. 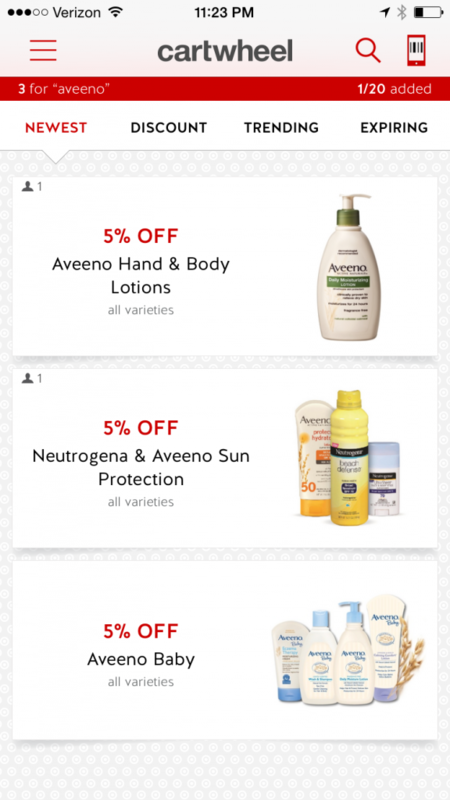 From 8/9 – 8/15 there are some great promotions for Aveeno, Neutrogena and Listerine products! As part of my back-to-school shopping, I picked up some NEUTROGENA® Body Oil and AVEENO® Daily Moisturizing Sheer Hydration Lotion. School time also means drier weather and it drives my little guy’s eczema crazy. We use the NEUTROGENA® Body Oil right after showering, it’s so light and sheer and vanishes into shower-damp skin, sealing in the moisture. Then the AVEENO® Daily Moisturizing Sheer Hydration Lotion is perfect for in between showers. With it’s naturally hydrating lotion, formulated with ACTIVE NATURALS® Colloidal Oatmeal, this AVEENO® lotion is great for keeping the skin hydrated, soft and healthy looking. Here are some of the other promotions running until August 15th, this Saturday! Just in time for back-to-school shopping, we are giving you all a chance to enter into a $100 Target Gift Card giveaway! Be sure to follow the Target Cartwheel app on Facebook and Twitter too! It’s a great way to stay up to date on current promotions. ← Ham, Egg and Cheese Monkey Bread – Make Ahead, Heat & Eat!